The Boatman riverside pub Windsor hosted the inaugural Dogs Dinner for Battersea Dogs and Cats Home on Saturday 19 November, raising over £900 for the charity. 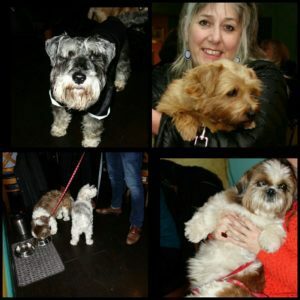 Being a dog-friendly pub, dogs were allowed to come – although normally they are only allowed in the bar or on the terrace and not in the restaurant area so this was a special occasion. The ten dogs who came were incredibly well behaved and their presence made the event even more special. The dogs had their own water station in the restaurant, Christmas doggy treats and dog-friendly frisbees which were provided by the pub. 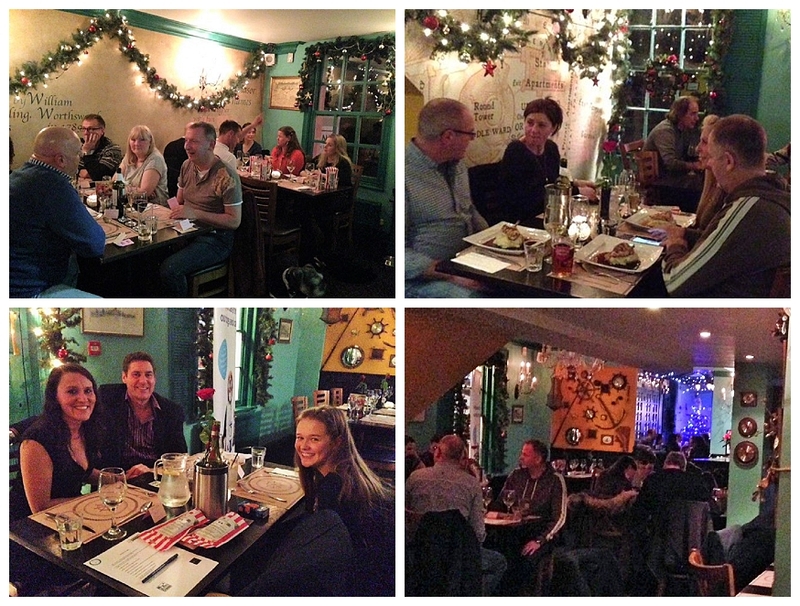 In total over 40 people enjoyed a scrumptious three course dinner with all proceeds donated to Battersea Dogs and Cats Home by The Boatman. The menu included Butternut Squash Soup with Crusty Bread; White Crab & Coriander Fish Cake served on Baby Spinach with Sweet Chilli Sauce; Large Field Mushroom filled with Spinach and glazed with Blue Cheese; and Cajun Spiced Smoked Chicken in Light Mayonnaise and Apple, with Mixed-Leaf Salad to start. The mains included Grilled Seabass Fillet on Creamy Polenta with Lemon-Grass Sauce; Pan-Roasted Chicken Breast on Chive-Mashed Potatoes with Tarragon Sauce; 7oz Rump Steak with Watercress Salad, Chunky Chips & Jus and Wild Mushroom & Pea Risotto with Aged-Parmesan and Truffle Oil. And it was all finished off with a choice of Sticky-Toffee Pudding or Tiramisu (homemade by The Boatman’s dessert chef Gabby) or a trio of ice-cream. The evening featured a quiz with ‘doggy’ questions which had been compiled by one of the Bow Wow Wags team (Battersea’s volunteers group) and this turned out to be pretty hard – especially the questions on artists who had sung tracks with ‘dog’ in the title. There was also a picture round where you had to name 20 cartoon and movie dogs and Team ‘Keith and the Reprobates’ were winning after this round on 17 out of 20! But the winning team caught up in the second round getting 34 out of the 40 questions correct, to walk away with the coveted first prize of a round of drinks. Raffle prizes included a trip in a kayak on the Thames with H2O and an enormous goody bag of doggy treats from Eton-based pet shop Wolf and Leo as well as a Meal for Two at The Boatman, bottles of wine, jewellery, candles and of course the obligatory cuddly toy (a cuddly dog of course)! Battersea Dogs and Cats Home is one of the two charities which The Boatman supports, chosen because The Boatman is a dog-friendly pub and also because it is a local charity (the home has a location based in Old Windsor as well as in Battersea). The work they do in rescuing, caring for and re-homing cats and dogs is vital, and if you’re interested in becoming a dog or cat foster carer, volunteer or fundraiser please contact the team. There are a whole host of ways you can get involved including dog walks, events, fun days, business partnerships and donations. Thanks to everyone who came and who made this inaugural event a truly memorable evening.